The relationship between Bristol and Bordeaux dates back eight and a half centuries to the marriage of Henry Plantagenet (Henry II) to Eleanor of Aquitaine in 1152. Bordeaux was then managed under the English Crown until the Battle of Castillon in 1453 which ended the 100 Years War, and the Gascon wine trade flourished. Bristol had the advantage over London in that it was closer and an easier sea voyage, as ships could avoid the English Channel where there was always the risk of being hijacked by the French! Bristol has remained a centre of the English wine trade ever since, and many of the Bristol Wine Merchants forged strong links with Bordeaux suppliers. As a result of this, when in the spirit of post war reconciliation it was felt that Bristol should 'twin' with a French city, Bordeaux seemed the most appropriate city to choose. It is of similar size, is on the west coast, is served by a river and when Bristol was the most important port in England, Bordeaux had the same stature in France. The Bristol Bordeaux association was created in 1947. Since then there have been many groups that have availed themselves of the connection. The most successful and tangible of these is the schools exchange which involves of 1,000 children every year. With this background of links between these two great cities for so long and with such a healthy recent relationship it was no surprise that Bristol became the centre of the Grand Conseil's focus for a Commanderie in England. It was established in 1980. Its success and continuing health has helped spawn the idea of further representation. 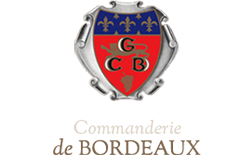 The Commanderie de Bordeaux is a vibrant, growing organization with several chapters through the UK. An innovation in the governance structure of the organization was the creation of the Conseil des Grands Maîtres Territoriaux, where certain designated Grands Maîtres representing broad sections of the globe meet to discuss basic policy and to advise the Grand Maître in Bordeaux. The Commanderie also is working to address some basic issues. Wine production worldwide has soared to meet ever-increasing demand, especially in the New World. But in France, the per capita consumption of wine has dropped by half over the last 20 years, as the consumption of wine becomes an act of connoisseurship rather than just a beverage. This has put downward pressure on most of the 10,000 separate châteaux in the Bordelais. Yet the 200-odd highly classified Bordeaux wines are selling at astronomic prices, often to speculators and newly interested consumers from the Orient. Commanderies thus continue their dual roles as gathering places for like-minded gastronomes hewing to a grand tradition, while also making others aware of the glories of the full range of the wines of Bordeaux. In 1996, the Grand Conseil de Bordeaux declared a contest for the composition of an anthem in praise of Bordeaux wine. Commandeurs from around the world were encouraged to participate. Submissions came from Europe, French-speaking Canada, and the United States. Bordeaux, toujours Bordeaux was composed by Eric E. Vogt, Maître of Boston, and presented live at a gathering of the Grand Conseil de Bordeaux at Châteaux de Roquetaillade, June 25, 1998. Vogt's anthem was declared a winner on the spot by the Grand Maître Jacques Hébrard, and Vogt was awarded "his weight in Bordeaux wine." Fortunately the weigh-in occurred after dinner. The fleur de lys (the historic symbol of France) in the chief or top segment symbolizes the bouquet of the wine. Below, each of the letters "GCB" is bordered by a crescent moon recalling the fact that the all-important port of Bordeaux was once known as the Harbor of the Moon. The golden leopard is the emblem of the historic province of Aquitaine, in which Bordeaux lies. This derives from the marriage of the dynamic and powerful Eléanore d'Aquitaine to Henri de Plantagenet, who subsequently became King Henry II of England in 1154. Lastly, the bunch of grapes at the bottom of the emblem denotes the raison d'être of our organization.